An outdoor pool free morning coffee in-room Wi-Fi access and quick access to I-10 are a few amenities that make Motel 6 New Orleans a good bet when visiting the Big Easy on a budget. 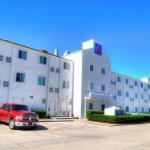 Three-story Motel 6 New Orleans offers 124 rooms with Wi-Fi access (fee) and cable TVs with expanded channels. Non-smoking rooms are available. Take advantage of free morning coffee to get going. The outdoor pool is a great way to cool off and relax on a hot day. Clean clothes on-site at the hotel's guest laundry. Pets are welcome. Parking is free. Motel 6 is off I-10 15 minutes from downtown New Orleans' French Quarter. There are several places to get a quick bite to eat within a half-mile. The hotel is 15 minutes from the Superdome and Tulane University. Shoppers shouldn't miss Riverwalk Marketplace 12 miles away. Additional shopping is available at Lakewood Plaza Shopping Center and Old Towne Shopping Center five minutes from the hotel. Louis Armstrong International Airport is 18 miles away.